The Hague Centre is the city’s oldest inhabited area. It is made up of 9 neighbourhoods, each with its own distinctive character: Archipelbuurt, Zeeheldenkwartier, Stationsbuurt, Oude Centrum, Kortenbos, Rivierenbuurt, Voorhout, Schilderswijk and Transvaal. Of all The Hague’s districts, The Hague Centre has the largest proportion of foreign-born residents, mostly non-Westerners. They are especially concentrated in the Schilderswijk and Transvaal neighbourhoods. The Archipelbuurt is named after the Netherlands’ former colony of Indonesia. Some of the neighbourhood’s earliest residents were old colonials who had come home after years abroad. Archipelbuurt is noted for its wide avenues lined with large houses. Many have been converted into offices, and new office buildings have also gone up on the south side. Some Archipelbuurt residents live in small apartments, and some of the earliest examples of socialized housing, called hofjeswoningen, are in this district. But it is a generally well-off area, and most inhabitants own and live in luxury apartments, mansions and town houses. Like so much of the architecture in The Hague, the houses in Archipelbuurt are designed in the neo-Renaissance style. These residences are located not far away from shops, restaurants and cafés, museums and parks, and the result is an exciting, cosmopolitan atmosphere. The neighbourhood’s history is preserved in many landmarks, including the Jewish and Roman Catholic cemeteries on the southwest edge of town. One centre of neighbourhood activity in Archipelbuurt is the Vredeskapel, where church and community events are held every week. Archipelbuurt lies between the Scheveningen Copses (thickets of trees in The Hague’s beach district) and the smaller Willemspark. The Bankastraat forms the boundary between Archipelbuurt and the district of Scheveningen. It is one of the busiest streets in Archipelbuurt, full of shops, restaurants, and bars. More construction work is planned for Bankastraat in the near future. The Surinamestraat is one of the city's oldest streets, dating back to 1881. It is often said to be the most beautiful street in The Hague. The residents of Zeeheldenkwartier are a mix of income levels. Large mansions stand next to smaller houses, new residential complexes and social housing projects. During the urban renewal schemes of the ’80s and ’90s, many houses were demolished and streets dug up and replaced with new ones. The municipality also supported owners who refurbished their homes. The Zeeheldenkwartier is a densely populated, fairly cosmopolitan and multicultural area, popular with expatriates, artists and well-off Dutch. Its neat squares and streets are full of cafés, restaurants, food stores, studios and art galleries. It is close to Noordeinde Palace, where the queen works. Stationsbuurt started out as a station area, linking The Hague to Amsterdam and Rotterdam in the mid-19th century. A wide street was later built joining it to the city centre, and it became a residential area. Stationsbuurt is close to the 165-year-old Hollands Spoor railway station, the oldest in The Hague. Over the decades the neighbourhood declined, sprang back and declined again, and plans for renovation kept falling through until the 1980s, when the combination of the city’s urban renewal project and the determination of Stationbuurt’s residents finally yielded results. The historical sections were left intact as new infrastructure arose, including student housing, rental places, and residential buildings. Renewal efforts are continuing, as the area still suffers from high unemployment, and below-average incomes. 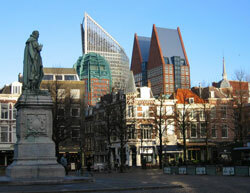 In Oude Centrum (Old Centre) between the Hague’s canals, centuries-old buildings nestle side-by-side with the modern. The area is both residential and commercial; houses and apartment buildings mingle with shops, department stores and offices. The Oude Centrum’s lively atmosphere and multicultural populace make it attractive to both visitors and residents. The Old Town Hall with its distinctive Renaissance design is in this area. Another interesting building in the area is the whimsical Snoeptrommel, also known as The Sting or The Candy Box, a round shopping centre next to the town hall. 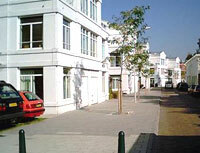 Its commercial area is centred around nearby Grote Marktstraat. The small Doubletstraat is the area’s red-light district. Kortenbos was once dominated by the South Holland Brewery, whose manufacturing plant sprawled across the district. In the 1970s, the brewery was demolished. New social housing sprang up in its place; the remaining homes were renovated to keep up with their new neighbours. In Kortenbos’s wealthy Hofkwartier section you will find Noordeinde Palace, the Queen’s official place of work. The Hofkwartier lies between large commercial and residential streets—the Hoogstraat and the Prinsestraat. It is a busy area with boutiques, specialty shops, bars, restaurants and cafés in close proximity to the Palace Gardens. Other areas of interest in the Hofkwartier include the Annastraat (with its New Style and Art Nouveau residences), the Groenmarkt (where the old City Hall and the centuries-old Goudé Hooft inn can be found), Hartog Street (which is lined with 17th- century houses on one side and the garden wall of the house of the 17th- century Dutch statesman Johan de Witt on the other), and the City Square, which was already a centre of community life even before The Hague was founded. Squeezed between railways and thoroughfares, the Rivierenbuurt is a quiet and relatively isolated area in The Hague Centre. Many buildings date from 1906 - 1939, designed in the neo-Renaissance style, with brick facades and arched windows. Rivierenbuurt is targeted by the municipality’s civic integration program, which gets residents to take an active part in Dutch society and in what is going on in their neighbourhood. A lot of the district’s development and rehabilitation is also the result of private residents’ own efforts. Due to the urban renewal efforts, some of the older buildings in the area have been demolished to make way for newer ones. The district provides housing for many people who work in the city centre. Voorhout is the oldest part of The Hague Centre. A settlement arose here in the 13th century, and today it is a lively neighbourhood with tree-lined walkways, museums, shops and entertainment centres. Voorhout’s long past is reflected in the many historic buildings in use as residences and offices. Schilderswijk takes up about one third of The Hague Centre, but its houses are built close together and there are few green spaces. Most of the 33,000 people living in this district are immigrants. The district has one of the country’s lowest average incomes and a high unemployment rate. Despite this, the crime rate in the area is not higher than in other areas, and there is a hum of economic activity. Transvaal is largely residential, but it is also the site of the Hague Market, one of the biggest open-air markets in Europe. Hundreds of market stalls sell food and products from all parts of the Netherlands and all over the world. Transvaal’s population is largely composed of ethnic minorities from Suriname, Indonesia, Turkey and Morocco. There are very few green spaces, and the residential buildings here are mostly social housing.